What offer are you signing them to? And when they say that, they mean a landing page or some way of getting a sale or a lead. That’s what they mean. But, they just mean signing them to your website. Now, most of the people that I know that do business online get all of their income and all of their customers via webinars. For example, Melanie Duncan, is running one live streaming webinar series at the moment and she uses GoToWebinar and it can hold up to a thousand people, and because in her first one she filled up with 8,000 people for a free online webinar, she is putting some more out because people are keen to attending the ones she does. People started saying, “Oh, I wanted that. Oh, I wanted to go.” She has gone on to record a couple more. How much time of hers does this take? An hour, two hours tops. Now, the beauty of this is you can say, “Why does she do it?” She’s built up to you a product launch but she’s not said anything about the product launch. She is giving a webinar that teaches a lesson. She is talking about list building. She has a product based on list building, on how to create perfect lead magnet, how to side your customer, how to deliver the lead magnet and then what to do, how to build a list. This is just everything about getting sales in a marketing system is to have people on autopilot getting your messages, people that are the right target. She does this because she can talk to everyone on an almost one on one basis. When you are on a webinar, you are probably on a computer or a tablet or something like that, maybe an iPhone, or a landline phone. It doesn’t cost you a penny, but you are watching it. It’s as if you are being taught one on one. She’ll put up a Powerpoint presentation and she will explain and she will give a very good lesson. She will give something that people would have been prepared to pay for. But, that lesson guides them towards needing the product that she’s got. She is showing people the problem they have and she’s gonna provide the solution. At the end, she will have an offer for people on the webinar. For the first x people that sign up, you will get x. It’s a standard procedure. Now, the actual presentation probably lasts around 45 minutes. The rest of it is the selling. She will stay there as long as it takes to hit a little money making. These people order. Some people at these webinars have conversion rates of 40 to 50%. A lot of the people will buy later on, even missing out any offers. She will get ongoing sales and backup sales of her other products from that and she will have people on her list. But more importantly, putting out the offers, she had to put Facebook ads. She also put it out through her partners, through her friends, her affiliates, she will have got people who opted in for the webinar that didn’t turn up, but they will be on her list. She knows how to build a list. It’s kind of ironic that webinars are about list building. Fabulous idea. I want you to look at webinars. I want you to sign up for webinars when you’re offered and to see how people do it. 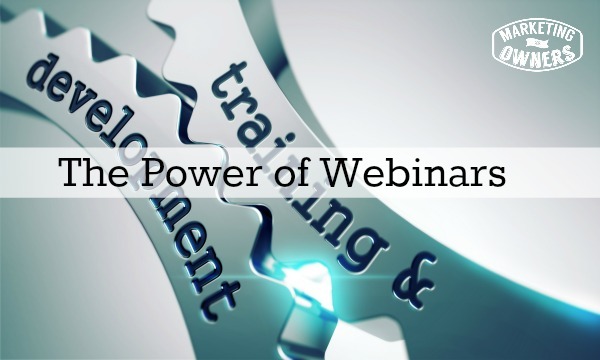 And then, to think, “How can I get some of my customers on a webinar? What can I give them? What value can I give them? And then, what offer can I bring?” That’s what you need to do. This is going to change your business if you can get in to online webinars because you get a lot of people. You don’t have to go and visit them. You can present to them, tell them everything they need to know about. Then, shows how and what expert you are. Shows your product, shows your service. Teach them something and then make them an offer. It works for any business. Just think of the way. In the old days, people would reserve a room in the hotel , get people to drive and people to sign up. Maybe, you might have to make a deposit, say that you could pay the room. You don’t need to do this. You don’t even need to use GoToWebinar, but it is one of the easiest ways. In later episodes, I am working on a system where you don’t have to pay anything. Once I get that going and once I get it off the path, I’ll tell you all about it. To make sure you know when that system is available, make sure you are a member of the martketingforowners.com website. Go to marketingforowners.com/join. It’s free. Yes, it’s free. There is nothing for sale. There is no catch. That’s why you get the really good stuff. I promise. Everything that I share here is good. Webinars are the thing. Keep your eye in it. It’s the way… When I sell any products, it’s what I use. Today, I’m going to recommend that you have a look at James Altucher. James is a funny old fellow. There is just something about him, something kind of addictive. His writing is superb. He’s a prolific writer. He’s written quite a few books. This one is Choose Yourself! Now, James has made a fortune and James blew it. I have never ever read anyone or heard anyone be so honest. We’ll be talking about his podcast in another episode later this week. But, James is honest and what he means by Choose Yourself! is he is saying instead of listening to everyone else, instead of listening to what everyone else tells you what to do, choose yourself. Don’t follow the norms. Choose yourself. James blew a fortune. He explains how he did it. He’s got no excuse. He actually admits he just wasted it. Fortunately, he made one again and I think he blew it again. But James, if you ever suffer from depression or anything, James was suicidal. He will talk you through how he actually comes in play to them, worked out the best way to commit suicide and why he didn’t and how that affected his life and where he is at now and what he does to keep himself from going there again. Very, very, very honest. 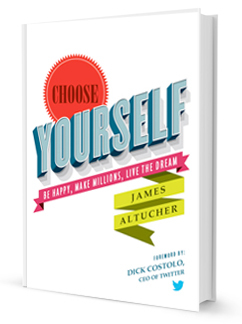 Choose yourself!, James Altucher. Great guy. Anyway, that’s it for today. See you tomorrow. What webinars would you like to attend?